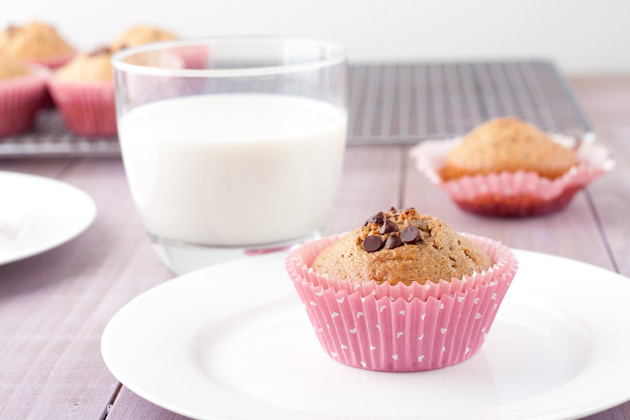 High protein, grain-free muffin recipe made with bean flour and just 8 ingredients! Preheat oven to 375F and line a 12 cup muffin pan with muffin liners. Set aside. Combine dry ingredients in a small bowl. Set aside. Whisk wet ingredients together in a large bowl. Add dry ingredients to wet and mix until incorporated. Fold in ½ cup mini chocolate chips. Divide muffin batter into prepared muffin cups and sprinkle the tops of the muffins with remaining chocolate chips (approximately 3 tablespoons). Bake in preheated oven for 20-22 minutes, or until toothpick inserted comes out clean. 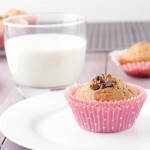 Allow muffins to cool in the pan for 1 minute before removing from the pan and placing on a cooling rack to cool. Muffins can be stored for a few days at room temperature. Keep in the fridge to prolong time, or freeze in an air-tight container for up to 3 months.